** Know your local laws! Certain items in the kit are restricted in some areas. We can remove the hi-cap mag, if required by your state (put a note in the comments section when checking out...) Convert your 870 shotgun into a compact, well balanced 12 gauge Bullpup! This stock is easy to install, and drops almost 10" off the length of your shotgun. This is conversion kit, you supply the 870! Convert your Mossberg 500/590 or Maverick 88 shotgun into a compact, well balanced 12 gauge Bullpup! This stock is easy to install, and drops almost 10" off the length of your shotgun. This is the conversion kit, you supply the 500/590/88! The High Tower Armory 90/22 is a compact, maneuverable Bullpup conversion/stock kit for the Ruger® 10/22® which utilizes a fully ambidextrous Bullpup design for superior balance and ergonomics. 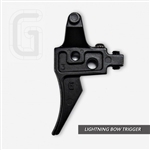 This incredibly durable, military grade polymer stock will reduce the overall length of most 10/22’s to about 26 1/2 inches, just over the federally required minimum length for rifles! Kel-Tec factory part, made in the USA! New "Gen 1" Short Pull Hammer for the PS90 is machined from sold billet 7075-T6 Aluminum, mil 8625 hard coat anodized, and Teflon coated to make them silky smooth. Modeled from the GEN 1 hammer, these are a direct drop in to all Gen 1,2,3,4 hammer packs. These are a great upgrade to your factory hammer pack. Features include... 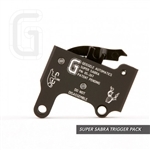 Reduced trigger pull length by over 35%, Reduced felt trigger weight by over 15%, Factory "drop safety" remains completely functional, No permanent modification to your OEM pack required. The new aluminum hammer weighs slightly more than the plastic piece, but it makes for harder primer strikes! Get just the Hammer, or add the matching Aluminum Sear for an additional $80! With this Tavor® muzzle brake you can extend your 9mm Tavor® to 30" overall length. With this Tavor® muzzle brake you can extend your 5.56/.233 Tavor® to 30" overall length.